Even centuries later, the final decades of the twentieth century are still regarded as one of the darkest and most perilous chapters in the history of humanity Now, as an ancient and forbidden technology tempts mankind once more, Captain James T. Kirk of the Starship Enterprise must probe deep into the secrets of the past, to discover the true origins of the dreaded Eugenics Wars -- and of perhaps the greatest foe he has ever faced. 1974 A.D. An international consortium of the world's top scientists have conspired to create the Chrysalis Project, a top-secret experiment in human genetic engineering. The project's goal is the creation of a new super-race to take command of the entire planet. Gary Seven, an undercover operative for an advanced alien species, is alarmed by the project's objectives; he knows too well the apocalyptic consequences of genetic manipulation. But he may already be too late. One generation of super-humans has already been conceived. Seven watches as the children of Chrysalis-in particular, a brilliant youth named Khan Noonien Singh -- grow to adulthood. Can Khan's dark destiny be averted -- or is Earth doomed to fight Singh a global battle for supremacy? 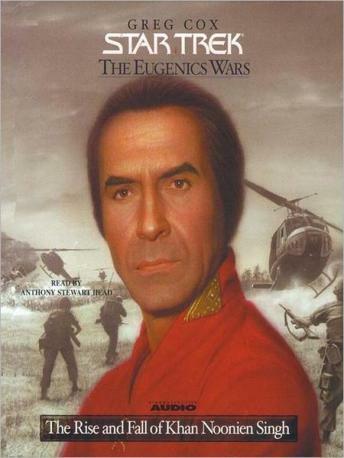 The Eugenics Wars: Volume One is a fast-paced thriller that explores the rise of the conqueror known as Khan. Good listen...just wish the others of the series were available.